Pearl of the Bosporus and one of the most popular in the city. The Mediterranean and Turkish dishes are as famous as the entertainment. Comparable to any of Michelin-starred places. 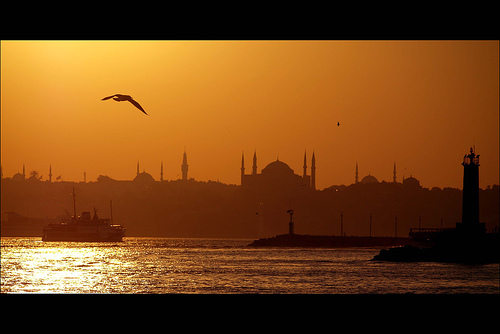 In Sortie you will find several fine restaurants with a magnificent Bosphorus scene. After dinner you move to the dance floor and enjoy the lounge music which echoes over the Bosphorus. Located between the first and second Bosporus bridges, overlooking the Anatolian side with one of the most stunning Bosporus views. The menu of Ulus 29 covers a variety of cuisines, from a wide sushi selection to fresh lobster, plus in-house traditional classic food. Ulus 29 has a terrace bar in the summer months and serves as both bar and lounge restaurant. The DJ at the Terrace bar livens up after dinner. (During May and September serves as a restaurant / During September and May serves as a restaurant & club). Anjelique Istanbul is a place to chill out and enjoy the views of the Bosphorus. The restaurant is lively and the menu offers Mediterranean food as well as sushi. Offers an amazing view of the Bosporus. At midnight the dining room and lounge explode as a full-on club with occasional live musical performances, international DJs and pop celebrities. The lounge part is sophisticated and riendly and the club part is basically one large dance floor with bars on the side and pretty good music being played. Modern café-bistro-bar, delicious food, Lucca’s prize-winning cocktails, pleasant atmosphere and good service. Lucca is especially known for its signature creative cocktails such as Satsuma Vodka, its addictive tapas prepared by the Spanish Executive Chef Willy Moya, weekend breakfasts and brunches, pre-night out dinners, and the upbeat crowd. Don’t come to supperclub if you’re in search of a traditional restaurant or if you are afraid of new experiences. However, if you’re looking for an unusual dinner experience in an unexpected place and want to discover the creative corners of your personality, then come to Supperclub. The open kitchen, as we know it from Amsterdam, is introduced here too. Blackk serves as a resto-lounge, club and Levendiz Greek Tavern. Great views over the Bosphorus. Design: Rococo style with edgy touches of modernism. Al Jamal has become a favorite among Istanbul’s jet set. Delicious food, incredible interior design and colorful shows. Experience fabulous belly dancing performances with superb Middle Eastern style food and outstanding service. Feel like a sultan in a harem. Fabulous interior design, mix of Western and Mediterranean music. Located in a 103-year old distinguished Art Nouveau townhouse, Changa has been serving dinner (except Sundays) since 1999. Under the supervision of renowned chef Peter Gordon, Changa’s kitchen presents modern Mediterranean style dishes utilizing fusion techniques. After several years, Mikla is still drawing crowds to its Scandinavian style dining room in the Marmara Pera Hotel. Supervised by Swedish-Turkish chef Mehmet Gür, Mikla’s sky bar is perfect for a romantic night out. Mimolett Istanbul presents the refined tastes of Mediterranean cuisine with its own interpretation and special sauces. The restaurant takes its name from traditionally produced Mimolette cheese. Mimolett was established in 2009 by Chef Murat Bozok who has worked in Michelin-starred restaurants for many years. I would like to thank Ugur Ilgar for providing Mapplr with this list of hip restaurants. Ugur is the founder of LuxuryIstanbul, a luxury travel company that organizes tailor-made holidays and special tours (shopping, history, archaeology, art and more). His firm can advise you on which hammam to visit and make a reservation for you.